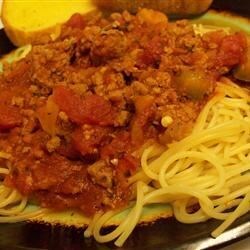 "A quick and tasty spaghetti sauce. I make it for my family all the time, and they love it. Spoon sauce generously over spaghetti noodles. Best served with generous portions of garlic toast." Very Very delicious! It's slightly spicy but nothing my 3 and 6 year old can't handle and they don't like spicy dishes at all.